Eliana Sohn had been to Israel four times before, including a gap year of study in Jerusalem, but her experience this summer has forged a new kind of connection. 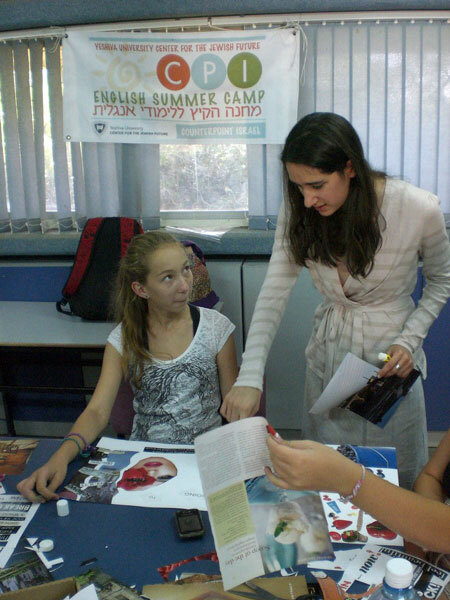 As a counselor at a summer camp in Arad — the community twinned with the Jewish Federation of Central New Jersey through the Jewish Agency for Israel’s Partnership 2000 program — she came to know well the young campers, their parents, and other residents and explored the “trials and triumphs” of life in the Negev town. Sohn is one of 34 students from North America, South Africa, and New Zealand chosen to participate in Yeshiva University’s Counterpoint Israel program July 12-Aug. 18, working as counselors at summer camps with youngsters from Arad, Dimona, and the Yemin Orde Youth Village. This is the first time Counterpoint has run a camp in Arad, serving disadvantaged area teenagers. The Central federation and its partner federations in the P2K cluster, through campaign donations, provided funding for the camp. In appreciation, YU made a point of including 14 students from Central and other NJ communities. It also enlisted the help of Rabbi Joshua Hess of Congregation Anshe Chesed in Linden as rabbinical leader of the Arad camp. Sohn, whose goal is to be a Jewish educator, is a student at SUNY Rockland Community College in Suffern, NY. She said that with an awareness of how experiential learning can expand her capabilities, she has worked in several Jewish day schools and coordinates events for Yachad, the National Jewish Council for Disabilities. This week Sohn was about to leave Arad to begin a stint with Counterpoint Yemin Orde, teaching teenagers from the Yemin Orde Youth Village — which was damaged by the devastating Carmel forest fire last December — on the Yeshiva University Israel Campus in Jerusalem. She said that though she was tired from her work in Arad, she was just as excited about this next challenge.